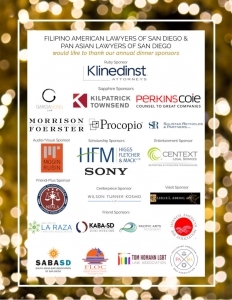 MoginRubin LLP is the Audio Visual Sponsor of the 41st Annual Dinner and Installation of Officers, hosted by Filipino American Lawyers of San Diego and Pan Asian Lawyers of San Diego. 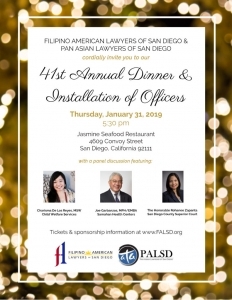 The dinner will take place on Thursday, January 31st, 2019 at Jasmine Seafood Restaurant in San Diego, California. Please click here for more information about the event, and here for registration information.